April turned out to be a truly eventful month at The University of Jordan (UJ), especially at the School of Foreign Languages. 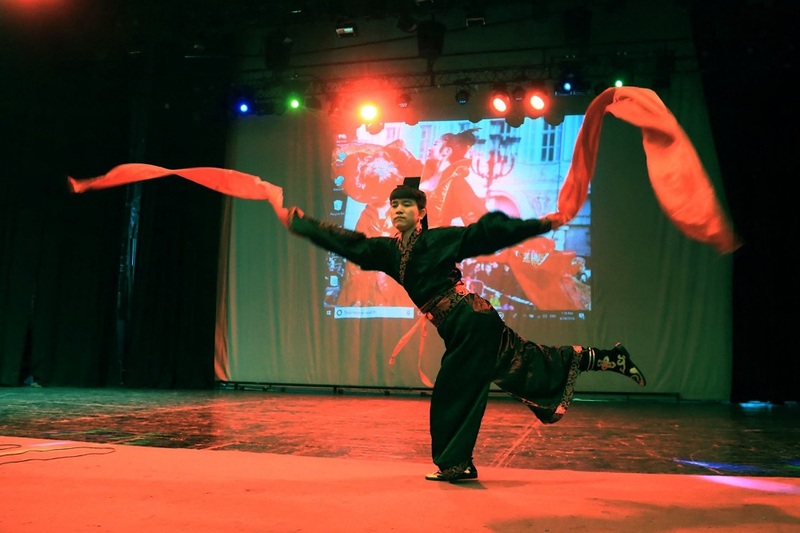 Several international and multicultural activities and events took place on campus and off campus during the month that brought the world’s cultures to UJ and its students. The 2018 International Heritage Exhibition was held from 24 to 26 April, outside UJ’s restaurant gardens. Organized by the Foreign Student Affairs Office of the Deanship of Student Affairs, the exhibition is an opportunity to bring the international students' heritage and cultural backgrounds into campus. The annual event contributes to the promotion of mutual understanding and reciprocal knowledge of cultural, ethnic, and linguistic diversity among students. The exhibition offered visitors a glimpse into the traditions of Saudi Arabia, Yemen, Syria, Iraq, Palestine, Kuwait, Tunisia, Algeria, Libya, Singapore, Ghana, Indonesia, Turkey, Bulgaria, Senegal, Brunei Darussalam and Jordan. Each team displayed a uniquely designed corner reflecting their national identity, where students dressed in their country's traditional outfits, and showcased foods, folklore and music from their respective countries. They also displayed photos and models of famous archaeological sites, geographical maps, and historical books. The event witnessed the attendance of several ambassadors, cultural attaches, diplomatic personnel, and visitors from various Arab and foreign communities in Amman. It's worth noting that there are 5,200 foreign students at the university, constituting 14 per cent of the total number of enrolled students. On Thursday, April 5th, the University of Jordan (UJ) celebrated the cultures and traditions of several Turkic speaking countries and communities in an event called Turkic Cultures Festival. Organized by the Turkish Language Division at the School of Foreign Languages, the festival highlighted the rich cultural heritage shared by the peoples of Azerbaijan, Turkey, Kazakhstan, Uzbekistan, and Kyrgyz Republic. The event constituted a learning experience for UJ students as they witnessed the various tastes of the Turkic cultures. The event, which was attended by representatives of embassies, diplomatic and cultural personnel, and included folk music, dances, and traditional games and the local cuisine of the participating countries, became one of the highlights of the School of Foreign Languages. The Department of Asian Languages at the School of Foreign Languages organized on April 24th a cultural festivity aimed at expanding the students' knowledge about the different countries, traditions and languages of Asia. The Festival introduced a range of activities and events to broaden the cultural perspective of students. The Festival included several cultural activities, folkloric performances, and interactive quizzes with the audience, reflecting the cultural heritage of Turkey, Russia, South Korea, China and Japan, presented and performed by the students of the Department. The Festival also featured Turkish and Russian theater performances, Chinese Kung Fu, and a traditional Korean Mask Dance and a Taekwondo show, as well as a translation competition at the end. The Spanish Language and Culture Days were a unique opportunity for students from the School of Foreign Languages to highlight their language skills and knowledge of the Spanish culture and history. The event was organized by the Department of European Languages in cooperation with the Spanish Embassy and Cervantes Institute in Amman from 24 - 26, April. In presence of the Venezuelan Ambassador, the deputy head of mission of the Spanish Embassy, and the director of the Cervantes Institute in Amman, the three days were packed with all sorts of entertaining and educating events combining elements of Spanish folk music and dance, traditions and civilization. The Spanish Language and Culture Days included plays from the Spanish literature, expressive sketches on issues related to interpretation and translation from Arabic to Spanish, documentary films about Spain and its territories, stereotypes and culture, in addition to a guitar concert and a culinary corner to get a glance at the most popular Spanish dishes.